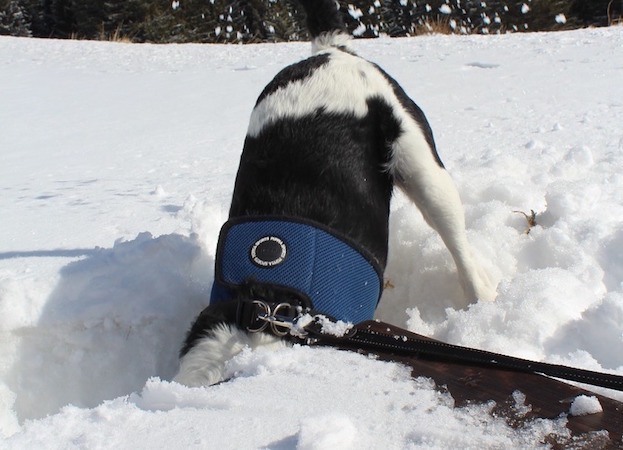 Digging is a fun pastime for many dogs as it provides a distraction from day-to-day activities, gives them a new form of exercise and lets them explore their environment - perhaps to the point of discovering new toys to play with. The problem with this "fun" activity is that it is more problematic for owners, especially if dogs decide that a prized lawn or flowerbed is the ideal spot for a little exploration. This brief guide will look at how to stop your dog from digging. Understand why your dog is digging. Dogs can dig holes for a number of reasons. Some can be especially worrying for owners, such as the desire to escape the property or catch prey, but quite often the animal is simply looking to amuse themselves out of boredom or to gain your attention. Look at where your dog is digging and the pattern of their behaviour. Are they digging by the fences or just in random spots around the property? Once you have an idea of the cause, you can work on the solution. Provide a solution based on their behavioural traits. If your dog is looking to escape, work to secure the perimeters and make the yard a more inviting place for them to play. If your dog is digging out of boredom or pent up energy, the simple solution is to ensure that they get enough mental stimulation and exercise throughout the day. If they have been on a long walk or have played fetch in the park, they are less likely to expend energy digging up the garden. Also, if they have a more fun game or toy to play with, the appeal of what may lie beneath the soil or on the other side of the fence will fade. The problem with this approach, however, is that try as you might to distract them from this behaviour, they may still be drawn back to digging. Digging is instinctive so it may be best not to fight it, but to simply work around it. Some experts in dog behaviour will point out that digging is a natural response in our dogs an there is an instinct to do it. This means that it can seem cruel to stop them from digging all together. A solution to this is to encourage them to dig in their own play areas, aware from the lawn and flowers. We have sandboxes for kids to dig in so why not have one for a dog? Rewarding them for digging here, and discouraging them from digging in the wrong place can show the animal what is acceptable behaviour without completely denying them of something they enjoy. How to stop your dog from digging. As long as you appreciate that you may never be able to stop the drive to dig entirely, you can work towards an effective solution. Take the time to understand the cause of your animal's desire to dig, look into simple ways to make the behaviour seem less appealing - such as increased exercise and mental stimulation - and remember to use positive reinforcement when they adapt their behaviour in the desired way.